Duodji, is a centuries old Sami handicraft, that dates back to a time when the Sami were far more isolated from the outside world than they are today. 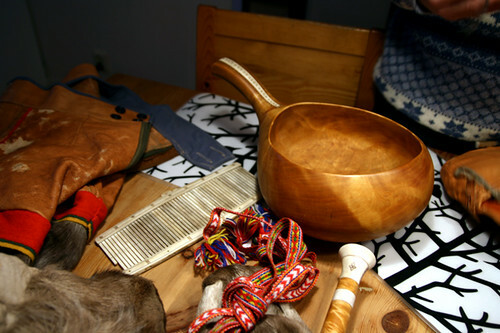 Duodji tools and clothing accoutrements served their purpose to be functional and useful, however this does not means that the Sami handicraft is unartistic. Sami doudji artist are able to bring function and art together in such a delicate way to create beautiful works of art in their own right. These functional items include, knives, cases, ladies bags, wooden cups, certain articals of clothing, etc. Duodji items were made and meant to be used in an everyday work environment. Traditionally Sami handicraft was divided into two sub-groups, – men’s and women’s handicraft – men used mostly wood and antlers as well as other bones from reindeers when crafting, women used leather, and roots. The traditional Sami colours are red, green, blue and yellow. At least in Sweden, there is an association who brings together most of the Sámi artisans, to guarantee they authenticity of the products. Finding products with their certification label is a safe way to buy Sámi handicrafts, though if you are really interested on them the better thing you can do is to attend the Sámi Marknad, a winter fair that takes place in Jokkmokk every February and that is considered one of the most important Sámi events. 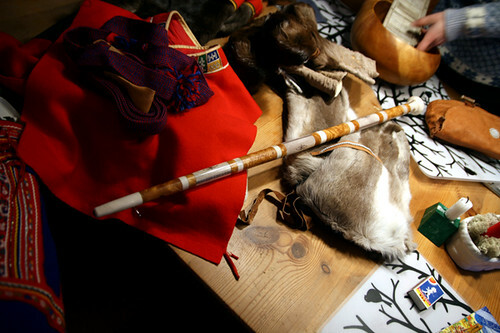 Sameslöjdstiftelsen: certified Sámi Duodji from Sweden. Before I came with the idea of the around-the-world journey, I was already interested in the situation of the Sámi, the indigenous people from Sápmi (wrongly named as Lapland), their land, that crosses Norway, Sweden, Finnish and the Kola peninsula in Russia. The story telling how I got interested on them is lond, and its origins are probably a bit unconscious, from some things I saw or read when I was a child. I will talk about it another day. But even now, I find fascinating that a nomade hunter-gatherer society still survives in Europe in the 21st century. For that reason, the last december I visited them. With temperatures around 15 celsius degrees below zero and only three hours of daylight, it was probable that there were almost no tourists and it was easier for me to ask for the things I was looking for. Everything achieved from that trip was positive, much more than I had thought. In other posts I will write about everything I learned there; now, I just wanted to share some photos I brought back home.